No! your phone will not connect to your computer through the usb when debugging from Visual Studio using the “device” option. I have been banging my head for a couple of days and cold not figure out what was wrong. When connecting to my backend in Azure the app was working correct, but not when running locally for debugging. When searching www.stackoverflow.com and googling for the error I got “Failed to load resource: net::ERR_CONNECTION_REFUSED” I got lured away into believing this was related to Cross-origin resource sharing (CORS). 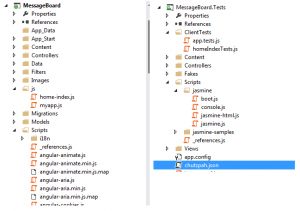 I´m using Visual studio 2013 and the chutzpah plugin with jasmine to test my angularjs code and I struggled for hours to get the tests running in the Test Explorer, it all turned out to be a problem with getting the references correct. How to configure chutzpah paths to find the files in a different project than your test project. It took some effort for me to find out, the documentation in the links below for how to configure the paths is not realy showing exactly how to (or I couldn´t find it), so I want to share my solution. when trying to include the _referenses.js in chutzpah.json I couldn´t make it work. so I thought it might be something with the paths not being interpreted correctly, but when I tried to do like this it didn´t work either so I reverted. And I ended up with the references to the real files instead (perhaps the best way to do it? 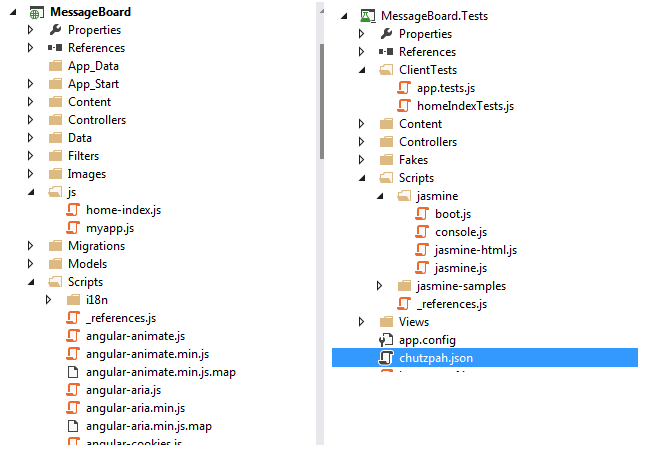 ), and I put the chtuzpah.json file in the root of my test project.